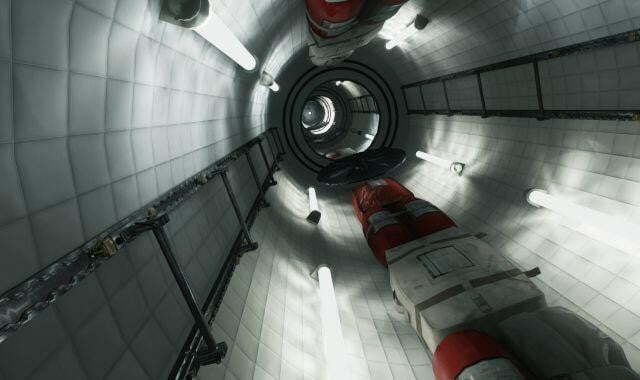 Christopher Nolan’s upcoming sci-fi adventure Interstellar is making use of the Oculus Rift virtual-reality technology for an interesting promotion ahead of the film’s November premiere. The film follows a team of astronauts tasked with using a newly discovered wormhole to traverse space in ways no one has ever done before, and Paramount Pictures and IMAX are offering fans a chance to step inside the film’s Endurance spacecraft for a virtual tour in zero gravity at select AMC theaters, free of charge. Attendees will be able to sit down in specially designed chairs and use the Oculus Rift Development Kit 2 to experience life inside the film’s spacecraft. The New York City portion of the tour wrapped up this week, but the exhibit will be available at three more locations around the country leading up to the film’s release in theaters. Houston residents will be able to experience the exhibit October 17-19 at the AMC Gulf Pointe 30, and then it will move to the AMC City Walk in Los Angeles from October 25-27. The tour will conclude at the Smithsonian Udvar-Hazy Center Air and Space Museum in Chantilly, VA, with a two-week stay November 5-19. At each location, the exhibit will be open 11:00 a.m. – 11:00 p.m. local time. Interstellar will premiere in IMAX theaters November 5 and then receive a wide release two days later on November 7. The film stars Matthew McConaughey, Anne Hathaway, Jessica Chastain, Ellen Burstyn, John Lithgow, Michael Caine, Casey Affleck, and Topher Grace.